^ "Statutes & Constitution :View Statutes : Online Sunshine". Leg.state.fl.us. Retrieved November 29, 2016. ^ "Bush leads Gore by 327 votes in Florida recount, Associated Press reports". CNN.com. November 10, 2000. Retrieved October 10, 2018. ^ Toobin, Jeffrey (May 23, 2008). "The Dirty Trickster". The New Yorker. ISSN 0028-792X. Retrieved February 19, 2018. ^ "Election 2000 Timeline". Pittsburgh Post-Gazette. December 17, 2000. Retrieved April 24, 2017. ^ a b By. "Articles: Is Another Ballot Heist Coming?". Americanthinker.com. Retrieved November 29, 2016. ^ Tognazzini, Bruce. "The Butterfly Ballot: Anatomy of a Disaster". AskTog.com. Retrieved January 22, 2001. ^ "Do Voting Rights Notification Laws Increase Ex-Felon Turnout?". Ann.sagepub.com. January 1, 2014. Retrieved November 29, 2016. ^ "TV Guide Network's "25 Biggest TV Blunders" Special Delivers 3.3 Million Viewers and Becomes #1 Rated Special Among Women 25-54 [via press release from TV Guide Network]". The Futon Critic. March 2, 2010. Retrieved January 15, 2017. 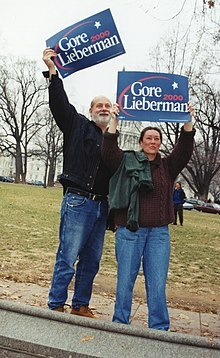 #3- 2000 Election Flip Flop Coverage: Several news channels announced Al Gore the winner of Florida, and thus the election. Then FOX News called the state for George W. Bush and the other networks followed suit. After more votes were counted, they all moved back to undecided, leaving Americans completely confused as to who was going to be the next president. The snafu caused news outlets to change the way they report on election night. ^ a b c d e Barstow, David; Van Natta, Don, Jr. (July 15, 2001). "Examining the Vote; How Bush Took Florida: Mining the Overseas Absentee Vote". New York Times. p. A16. Retrieved November 16, 2016. Republicans provided their lawyers with a detailed playbook that included instructions on how to challenge likely Gore votes while fighting for the inclusion of likely Bush votes. In some counties where Mr. Gore was strong, Bush lawyers stood by silently while Gore lawyers challenged overseas ballots, even likely Gore ballots. ... The Times asked Gary King, a Harvard expert on voting patterns and statistical models, what would have happened had the flawed ballots been discarded. He concluded that there was no way to declare a winner with mathematical certainty under those circumstances. His best estimate, he said, was that Mr. Bush's margin would have been reduced to 245 votes. ^ Perez-Pena, Richard (November 21, 2000). "COUNTING THE VOTE: THE ABSENTEE BALLOTS; Review Military Votes, Florida Attorney General Says". The New York Times. Retrieved January 12, 2015. ^ a b Fessenden, Ford; Broder, John M. (November 12, 2001). "Study of disputed Florida ballots finds justices did not cast the deciding vote". The New York Times. New York. Retrieved December 27, 2016. ^ "Irish-American Republicans - Our Achievements". Irishgop.com. Retrieved November 29, 2016. ^ "Miami Mayor Denies Gore Urged Him to Publicly Support Recount". articles.latimes.com. December 2, 2000. Retrieved November 29, 2016. ^ a b c York, Anthony (November 28, 2000). "How manual recounts helped Bush". Salon. Archived from the original on September 5, 2008. Retrieved April 25, 2017. ^ Wand, Jonathan N. (December 1, 2001). "The Butterfly Did It: The Aberrant Vote for Buchanan in Palm Beach County, Florida". American Political Science Review. 95 (4): 793–810. ISSN 1537-5943. ^ Dionne, E. J.; Kristol, William, eds. (December 1, 2010). "Florida Attorney General Advisory Legal Opinion AGO 2000-65, Date: November 14, 2000". Bush V. Gore: The Court Cases and the Commentary. Brookings Institution Press. p. 17. ISBN 0815706952. Retrieved December 3, 2016. ^ "NORC Florida Ballots Project". NORC at the University of Chicago. Retrieved November 16, 2016. ^ a b c d e f "Data Files – Media Group Files". 2000 Florida Ballots Project. American National Election Studies. Retrieved November 16, 2016. ^ a b c d e f g h "Data Files – NORC Files, Media Group Files". 2000 Florida Ballots Project. American National Election Studies. Retrieved November 16, 2016. ^ Damron, David; Shaw, Gwyneth K. (January 28, 2001). "Lake Erred By Tossing Write-ins". Orlando Sentinel. Retrieved November 28, 2016. ^ Maxwell, Scott; Damron, David (November 14, 2000). "Now Democrats Are Upset With The Way Lake Counted, Counters Threw Out 3,114 Ballots Because Voters Also Wrote In The Name Of Their Candidate". Orlando Sentinel. Retrieved November 28, 2016. ^ a b Florida Supreme Court (December 8, 2000). "No. SC00-2431, Albert Gore, Jr., and Joseph I. Lieberman, Appellants, vs. Katherine Harris, as Secretary, etc., et al., Appellees" (PDF). Retrieved November 30, 2016. For the reasons stated in this opinion, we find that the trial court erred as a matter of law in not including (1) the 215 net votes for Gore identified by the Palm Beach County Canvassing Board (at footnote: Bush claims in his brief that the audited total is 176 votes. We make no determination as to which of these two numbers are accurate but direct the trial court to make this determination on remand.) and (2) in not including the 168 net votes for Gore identified in a partial recount by the Miami-Dade County Canvassing Board. ^ Palm Beach County Supervisor of Elections. "2000 Presidential Election - Handcount (00genhc.xls)". 2000 General Election Results. Retrieved November 16, 2016. ^ Purdum, Todd S. (November 27, 2000). "Counting the vote: the overview; Bush is declared winner in Florida, but Gore vows to contest results". New York Times. Retrieved November 16, 2016. ^ "General, Nonpartisan and Special Elections Recount; Miami-Dade County, Florida". Miami-Dade County Elections. November 8, 2000. Retrieved November 28, 2016. ^ a b Isikoff, Michael (November 18, 2001). "The Final Word?". Newsweek.com. Retrieved November 29, 2016. ^ a b Wolter, Kirk; Jergovic, Diana; Moore, Whitney; Murphy, Joe; O'Muircheartaigh, Colm (February 2003). "Statistical Practice: Reliability of the Uncertified Ballots in the 2000 Presidential Election in Florida" (PDF). The American Statistician. American Statistical Association. 57 (1): 1–14. doi:10.1198/0003130031144. JSTOR 3087271. Retrieved June 12, 2016. ^ "The Long Count". Pollingreport.com. Retrieved November 29, 2016.